Aims Helicobacter pylori infection is the major cause of peptic ulceration and gastric cancer, and an important virulence determinant is its vacuolating cytotoxin vacA. Previously, we have described allelic variation in vacA which determines toxin activity and disease risk. Here we aimed to quantify vacA mRNA expression in the human stomach, define its genetic determinants and assess how well it predicts gastric pathology. Methods Gastric biopsies were donated by 39 patients with H. pylori infection attending for endoscopy at Queen's Medical Centre, Nottingham, UK. Total RNA was extracted, and vacA mRNA quantified by reverse transcriptase quantitative PCR. Separate biopsies were histologically scored for inflammation and atrophy using the updated Sydney system. H. pylori strains were isolated from further biopsies, and the nucleotide sequence upstream of vacA determined. Results vacA mRNA levels in human stomachs varied by two orders of magnitude independently of vacA allelic type. Among vacA i1-type (toxic) strains, increased vacA expression was strongly associated with higher grade gastric inflammation (p<0.02), neutrophil infiltration (p<0.005) and the presence of atrophy (p<0.01). A polymorphism at nucleotide +28 near the base of a potential stem-loop structure within the 5′ untranslated region was significantly associated with vacA transcript level and inflammation. Conclusions Increased gastric vacA expression during H. pylori infection is associated with inflammation and premalignant pathology. The +28 nucleotide within the vacA 5′ stem-loop stratifies disease risk among toxic vacA i1-type strains. vacA transcription varies between H. pylori strains grown in vitro.16 ,17 We hypothesised that the amount of VacA produced during infection, as well as its activity, would have important implications for disease. We aimed to quantify vacA transcript levels in gastric biopsies from patients with H. pylori infection, correlate this with inflammation, atrophy and intestinal metaplasia, and identify genetic determinants of vacA expression which may be additional markers of disease risk. Corporal gastric biopsies were donated by 39 patients with H. pylori infection (median age 56 years, range 30–82 years; 51% male) attending the Queen's Medical Centre, Nottingham, UK, for routine upper gastrointestinal endoscopy for dyspeptic symptoms. Informed written consent and approval from the Nottingham Research Ethics Committee 2 (08/H0408/195) was obtained. Patients taking proton pump inhibitors, non-steroidal anti-inflammatory drugs (NSAIDs), >150 mg/day of aspirin or antibiotics 2 weeks preceding endoscopy were excluded. Biopsies for isolation of H. pylori were immediately placed into isosensitest broth (Oxoid) containing 15% (v/v) glycerol, and then swabbed onto blood agar plates and cultured. For histology, formalin-fixed corporal biopsies (two per patient to avoid patchy changes) were paraffin-embedded, sectioned and stained with H&E for assessment of inflammation and atrophy. Grading was performed using updated Sydney scoring18 (0=not present, 1=mild, 2=moderate and 3=substantial) by an experienced histopathologist (AMZ) blinded to other data. Histological scores were representative of both corporal biopsies examined for each patient. A single corporal biopsy for each patient was taken for RNA analysis and immediately preserved in RNAlater (Sigma-Aldrich, Poole, UK). Genomic DNA was extracted from clinical H. pylori isolates as previously described.19 The vacA sequence from nucleotides 520–1055 (GenBank U05676), including the intergenic region between vacA and the upstream gene cysS (cysteinyl-tRNA synthetase), was PCR-amplified using primers DL120 and VA1-R,8 and the product sequenced by the Biopolymer Synthesis and Analysis Unit, University of Nottingham. Sequences were aligned using MegAlign (DNAStar, Madison, Wisconsin, USA). Nucleotide positions where three or more strains differed to the consensus were defined as polymorphic. Total RNA was purified from gastric biopsies using rotor-stator homogenisation and an RNeasy Mini Kit (Qiagen, Manchester, UK). Residual genomic DNA was removed by DNA-free DNase treatment (Life Technologies, Paisley, UK). cDNA was reverse transcribed from 200 ng RNA using an Omniscript reverse transcriptase kit (Qiagen) and random hexamer primers (GE Healthcare Life Sciences, Little Chalfont, UK). For each sample, negative control reactions were prepared without reverse transcriptase to confirm the absence of genomic DNA. Triplicate reverse transcriptase quantitative PCRs (RT-qPCRs) were performed using a Quantitect SYBR Green PCR kit and a Rotor-Gene 3000 real-time PCR system (both Qiagen). vacA mRNA levels were calculated relative to a comparator biopsy cDNA sample included in all experiments (arbitrarily assigned an expression level of 100) using the Pfaffl method,21 normalising to the H. pylori reference gene 16S rRNA to correct for differences in H. pylori density or sample amount. A 259 bp vacA amplicon was amplified using primers VA1-F and VA1-R,8 and a 164 bp 16S rRNA amplicon amplified by primers 16S-rRNA-F (5′ CGATGAAGCTTCTAGCTTGC 3′) and 16S-rRNA-R (5′ ATAGGACATAGGCTGATCTC 3′). Thermocycling conditions were: 95°C for 15 min followed by 35 cycles of 95°C for 30 s, 56°C for 60 s and 72°C for 30 s. No template controls were included and melt curve analysis confirmed amplification specificity. Primer efficiencies, calculated from serial dilutions of the comparator sample, were 0.91 (R2=0.98) and 0.57 (R2=0.99) for vacA and 16S rRNA, respectively. Associations between gastric vacA mRNA data and genotype, histological data, disease type and promoter region polymorphisms were evaluated by Mann–Whitney U tests or by Kruskal–Wallis analysis of variance (ANOVA) for multiple comparisons, with multiplicity adjusted pairwise p values calculated by Dunn's test. Tests were performed using GraphPad Prism 6 software, and two-tailed p values less than 0.05 were taken as being statistically significant. While vacA allelic type is a major determinant of gastric cancer risk among patients with H. pylori infection, the association is imperfect, and we hypothesised that the amount of VacA produced by a strain may also be important. Reliable quantification of VacA production by H. pylori in the human stomach is hampered by the lack of specific antibodies, so we aimed to assess levels of vacA mRNA in gastric biopsies using RT-qPCR. We quantified vacA mRNA in corporal gastric biopsies from 39 patients with H. pylori infection. vacA transcripts were detected in biopsies from 21 patients, with levels varying from 0.1 to 46.8 relative vacA mRNA units. For the remaining 18 patients, no vacA expression was detected in vivo. By assaying serially diluted comparator sample cDNA, we determined our vacA mRNA detection limit as being eightfold below the lowest positive value obtained from patient biopsies. Thus strains with undetectable vacA mRNA have expression below this level. We determined the vacA allelic type of each strain by PCR8 ,9 ,22 to assess whether this correlated with gastric vacA mRNA level. Two patients were excluded because typing suggested the presence of multiple strains with different vacA types, leaving 37 patients in our analysis. There was no significant difference in relative vacA mRNA levels between toxic i1-type and non-toxic i2-type strains (medians 0.93 (n=27) and 0.96 (n=10), respectively, p=0.99, Mann–Whitney U test). There were only four patients infected with s2-type strains, too few to compare signal region types; however, one was a high- and two were low-level transcribers. Moreover, one had undetectable vacA mRNA. We also assessed cagA status by PCR for all 39 infecting strains, and again there was no association with relative gastric vacA mRNA level (medians 0.93 for cagA+ strains (n=29) and 0.96 for cagA- strains (n=10), p=0.47). Next, we assessed whether H. pylori vacA expression in the stomach was associated with inflammation and precancerous damage by scoring histological parameters using the updated Sydney system.18 We previously showed that only i1-type strains are actively toxic in vitro.9 In agreement with this, 8 of the 10 patients infected with i2-type strains had mild (grade 1) inflammation and none had atrophy or intestinal metaplasia. Our main interest was why i1-type strains have different associations with inflammation and damage; so we limited subsequent analysis to 25 patients infected with i1-type strains for which histology samples could be located. First we assessed the association between vacA expression and ‘chronic inflammation’ score, defined by the density of mononuclear inflammatory cells in the biopsy specimen. Median relative vacA mRNA level was significantly higher in patients with grade 3 inflammation than those with grade 1 inflammation (p<0.02; figure 1A). Patients with grade 2 inflammation had intermediate vacA mRNA levels. Seventeen patients had grade 1 or 2 neutrophil infiltration, referred to as ‘activity’ in the Sydney system, eight had no activity (grade 0) and none had grade 3 activity. Median relative vacA mRNA level for patients with grade 2 activity was significantly higher than for patients with no neutrophil infiltration (grade 0; p<0.005); patients with grade 1 activity were intermediate (figure 1C). Only six patients had gastric atrophy, all grade 1. Median relative vacA mRNA level was significantly higher in patients with atrophy than without (p<0.01; figure 1E). Only two patients had intestinal metaplasia, insufficient for statistical analysis; however, their median relative vacA level was 6.5 compared with 0.0 for the patients without intestinal metaplasia. vacA mRNA level in the human stomach infected with Helicobacter pylori is associated with inflammation and atrophy. Gastric biopsies were scored for inflammation (A and B), neutrophil infiltration (C and D) and atrophy (E and F) using the updated Sydney system by a qualified histopathologist blind to all data. Relative vacA mRNA levels in separate gastric biopsies were quantified by reverse transcriptase quantitative PCRs using the Pfaffl method21 with 16S rRNA as a reference gene (arbitrary units). Data were stratified by vacA i1-type (A, C and E; n=25) or vacA s1i1m1, cagA+ genotype (B, D and F; n=20). Multiple comparisons for inflammation and neutrophil infiltration grades (A and C) were assessed by Kruskal–Wallis analysis of variance (ANOVA) and multiplicity adjusted pairwise p values calculated by Dunn's test are shown. Pairwise comparisons (B and D–F) were assessed by Mann–Whitney U tests for statistical significance. To avoid confounding effects from differences in vacA signal and mid-region type, and cagA status, we next stratified our data based on the 20 patients infected with vacA s1i1m1 cagA+ strains. We combined data for inflammation grades 2 and 3 to avoid small group sizes. 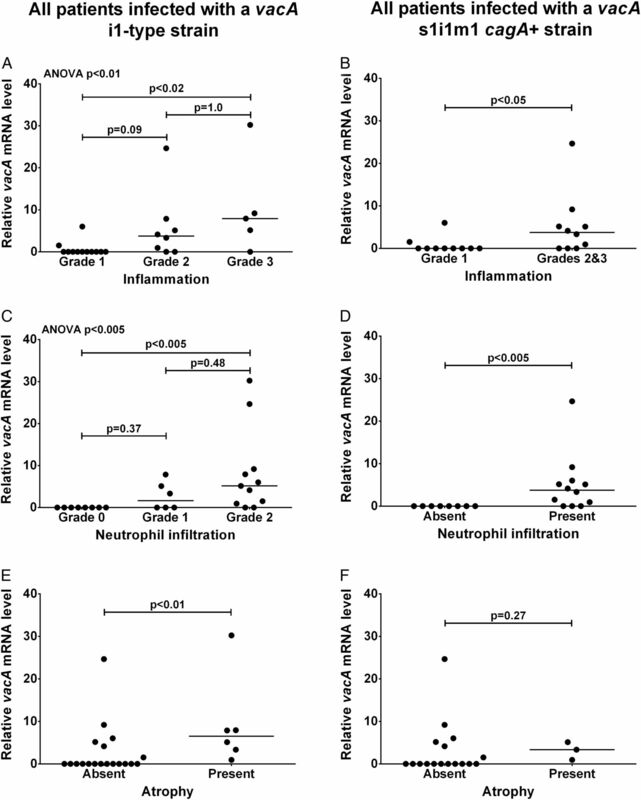 Median relative vacA mRNA level was significantly higher for patients with grade 2 or 3 inflammation than grade 1 (p<0.05; figure 1B), and for patients with neutrophil infiltration than for those without (p<0.005; figure 1D). Only three patients infected with vacA s1i1m1 cagA+ strains had atrophy, too few for reliable statistical analysis (figure 1F). Of the 39 patients studied, 27 had past or present gastric or duodenal ulcers or erosions and were collectively defined as a PUD group. Only one patient had GC and was omitted from this analysis. The remaining 11 patients showed no pathology on endoscopy and were defined as a normal group. There was no significant difference in median relative vacA mRNA level between the PUD and normal groups (figure 2). However, our study was not powered to detect such a difference. There remained no significant difference in median relative vacA mRNA levels when comparing the 22 patients with active ulcers and the normal group (medians 0.76 and 0.0, p=0.50). 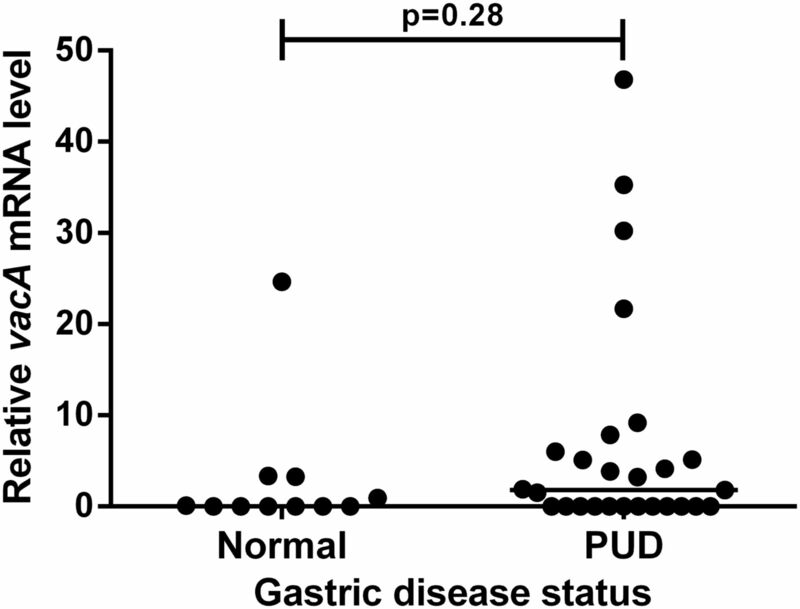 Peptic ulcer disease (PUD) does not correlate with in vivo vacA mRNA level. Pathological findings were recorded by a qualified gastroenterologist during upper gastrointestinal endoscopy for dyspeptic symptoms. Patients with past or present gastric or duodenal ulcers or erosions were defined as a PUD group. Patients showing no pathology were defined as normal. Patients taking proton pump inhibitors or antibiotics in the 2 weeks preceding endoscopy were excluded from the study. Relative vacA mRNA levels in gastric biopsies were quantified by reverse transcriptase quantitative PCRs with 16S rRNA as a reference gene (arbitrary units). Data were assessed by Mann–Whitney U tests for statistical significance. Having shown that inflammation and premalignant disease were associated with increased vacA mRNA among toxigenic, i1-type strains, we considered it important to assess the genetic determinants of high level vacA expression in vivo. We compared the nucleotide sequence between vacA and the upstream gene cysS for 27 strains to identify polymorphisms that correlated with our gastric vacA mRNA data (see online supplementary figure S1). Interestingly, 31/110 nucleotides in the vacA promoter region (end of cysS to vacA transcriptional start site) were polymorphic compared with just 11/119 nucleotides in the 5′ untranslated region (5′ UTR) of the encoded transcript (p=0.0003, Fisher's exact test). In agreement with previous studies,17 ,23 the vacA promoter had three polymorphisms: G/A/T(−32) within the −35 motif; and G/T(−14) and G/T(−7) within the extended −10 motif. Four polymorphisms were observed within a previously identified imperfect inverted repeat upstream of the −35 motif,17 with three strains having a perfect inverted repeat. None of these, or the remaining polymorphisms within the promoter region, correlated with gastric vacA mRNA level. We recently described a second inverted repeat located between +4 and +30 in the vacA 5′ UTR, predicted to form a stem-loop structure at the 5′ end of the transcript (figure 3).24 We showed that this potential stem-loop is important for stabilising vacA mRNA: disrupting its formation led to reduced mRNA half-life and decreased steady-state vacA transcript levels.24 At the third pairing position from the base, the 5′ stem is consistently thymine (uracil in mRNA) but the 3′ pairing nucleotide (position +28) can be either guanine (G(+28)) or adenine (A(+28)), the latter potentially stabilising the stem-loop more efficiently. In our previous work, we showed that substituting adenine for guanine at position +28 significantly increased vacA mRNA steady-state levels in two different strain backgrounds.24 Here we report that strains possessing A(+28) expressed more vacA in gastric biopsies than those with G(+28) (p<0.01; figure 4A). Furthermore, i1-type strains with A(+28) were associated with more inflammation (p<0.05; figure 4B) and neutrophil infiltration (p<0.01; figure 4C) than those with G(+28). A predicted stem-loop sequence is present near the start of the vacA 5′ untranslated region (UTR). (A) The intergenic region between the 3′ end of the upstream gene cysS (diagonal hatched box) and the start of the vacA open reading frame (white box) is shown with the −35 and −10 consensus promoter sequence positions, the transcriptional start site (+1) and the 5′ UTR (thick line) indicated. 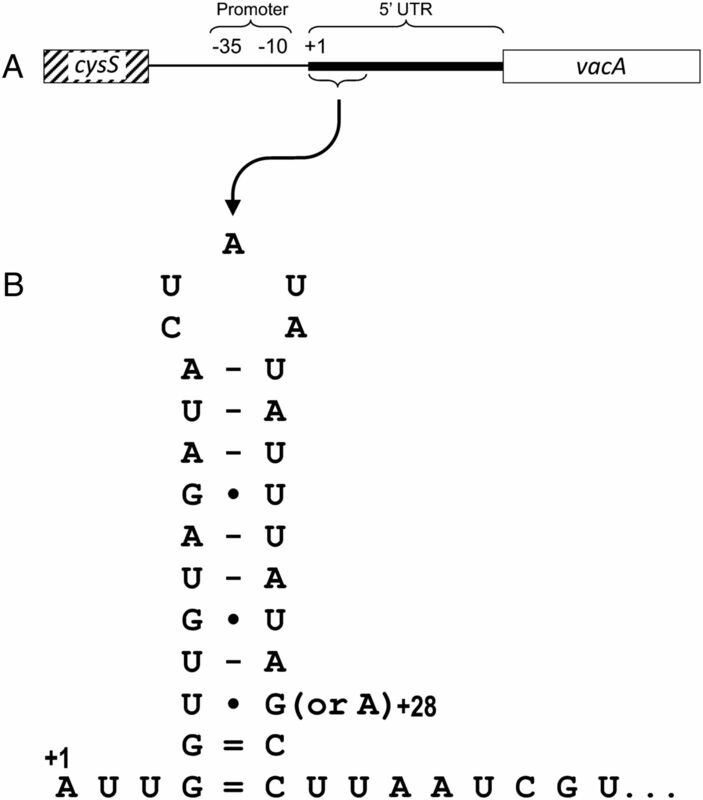 (B) The predicted mRNA fold of a potential stem-loop sequence located at +4 to +30 in the vacA 5′ UTR, with a G/A polymorphism at position +28 shown. A natural G/A polymorphism within a potential stem-loop in the vacA 5′ untranslated region (UTR) is associated with in vivo vacA mRNA level, inflammation score and neutrophil infiltration. The nucleotide at position +28 in the vacA 5′ UTR (A or G) was determined by sequencing for the infecting strain from 27 patients. Gastric biopsies were used to quantify the relative in vivo vacA mRNA level by reverse transcriptase quantitative PCRs for all 27 patients (A), and scored for inflammation (B) and neutrophil infiltration (C) using the Sydney system for 19 patients infected with i1-type strains. Data were assessed by Mann–Whitney U tests for statistical significance. The vacuolating cytotoxin is a major virulence determinant of H. pylori. Previously, we described vacA polymorphisms that affect its toxicity and devised simple PCR-based typing systems to identify these alleles among H. pylori strains.9–11 ,22 Subsequent vacA typing has shown that specific alleles, such as s1- and i1-types, are robust markers of increased disease risk in many Western populations.6 Here we show for the first time that in addition to differences in VacA toxicity between strains, vacA expression during H. pylori infection of the human stomach varies widely and is associated with the amount of inflammation and atrophy present. Previous studies have shown vacA expression varies widely between strains, but no correlation with promoter region polymorphisms was observed: sequence data were only reported for two strains studied by Forsyth et al,16 and there was insufficient variation at the +28 position in the 5′ UTR of the strains studied by Ayala et al17 to show the same association with vacA expression observed among our strains. An important difference in our study is that vacA mRNA levels were measured within gastric biopsies from patients with the infection, rather than from in vitro cultures of isolated strains. Despite many polymorphisms in the cysS–vacA intergenic region, we found only one that associated with gastric vacA mRNA expression, located at position +28 in the 5′ UTR. However, we cannot rule out that multiple polymorphisms affect vacA expression and have confounding effects on each other, masking any association with our expression data. Candidate polymorphisms are those located at −32, −14 and −7 within the promoter consensus sites. Indeed, replacing guanine with thymine at position −14 reduces vacA transcription twofold;23 so it is possible that the G/A polymorphism we observed at this position would affect vacA mRNA levels when assessed in an isogenic system. It was interesting that the vacA 5′ UTR was significantly more conserved than the upstream nucleotide sequence containing the promoter sites. One explanation could be sequence constraints imposed by important secondary structure formation in this untranslated mRNA region. Indeed, we have recently identified a potential stem-loop structure from +4 to +30 in the vacA 5′ UTR which we showed was important for stabilising the vacA mRNA transcript.24 Interestingly, the only polymorphism significantly associated with gastric vacA mRNA level and inflammation, G/A(+28), was located within this stem-loop sequence. In our previous work, site-directed mutagenesis was used to replace guanine with adenine at +28 in the vacA 5′ UTR of strains 60190 and SS1, allowing more favourable pairing with uracil at position +6 and potentially increasing the stability of the stem-loop. We found that isogenic mutants with A(+28) had significantly higher steady-state levels of vacA mRNA than their wild-type controls with G(+28).24 This supports our current finding that clinical isolates with adenine at +28 are associated with increased vacA mRNA level in gastric biopsies from patients infected with H. pylori. A recent study found vacA expression to be higher in patients with gastric cancer than in those with non-atrophic gastritis or duodenal ulcer.25 This agrees with our finding that higher vacA expression in the gastric mucosa is associated with increased inflammation and the presence of atrophy. Therefore, the disease risk of a patient with H. pylori infection is affected by both the VacA type of the infecting strain and the level of vacA expression during infection. This is important because the association between more active s1m1- and more recently i1-type strains and PUD or GC is not absolute. Furthermore, in countries where most H. pylori strains are s1i1-type, these markers of VacA toxicity do not allow differential determination of disease risk. Our finding that a natural polymorphism at nucleotide +28 of the vacA transcript affects vacA mRNA level shows that specific naturally occurring polymorphisms may affect vacA expression. This and other polymorphisms affecting vacA transcript levels may provide important additional markers for determining which patients are at greatest risk of developing severe gastric or duodenal disease, particularly among those infected with more toxic vacA i1-type H. pylori strains. Expression of the Helicobacter pylori vacuolating cytotoxin gene A (vacA) within the infected gastric mucosa varies considerably between strains. The level of vacA mRNA expressed in vivo correlates with gastric inflammation and premalignant pathology. A polymorphism at nucleotide +28 with the vacA 5′ untranslated region of the transcript is associated with gastric vacA expression level and inflammation, and may provide an additional marker of disease risk. The authors thank the patients and staff at the Queen's Medical Centre, Nottingham University Hospital.
. Heterogeneity in levels of vacuolating cytotoxin gene (vacA) transcription among Helicobacter pylori strains. Infect Immun 1998;66:3088–94.
. Molecular techniques to detect pathogenic strains of Helicobacter pylori. In: Clayton CL, Mobley HLT, eds. Methods in molecular medicine, Helicobacter pylori protocols. Totowa, NJ, USA: Humana Press, 1997:133–45.
. Simple and accurate PCR-based system for typing vacuolating cytotoxin alleles of Helicobacter pylori. J Clin Microbiol 1999;37:2979–82.
. Mutational analysis of the vacA promoter provides insights into gene transcription in Helicobacter pylori. J Bacteriol 1999;181:2261–6. CGS and DPL contributed equally. Contributors JCA, DPL and CGS conceived and planned the study. CGS, GLN, SRP, NRH and AMZ carried out the experimental work. CGS, DPL, KR and JCA analysed the data. DPL, CGS, KR and JCA wrote the manuscript. Funding This work was supported by Cancer Research UK (C8968A/A11204); Nottingham University Hospitals Charities, and the National Institute for Health Research (NIHR), through the NIHR Biomedical Research Unit in Gastrointestinal and Liver Diseases at Nottingham University Hospitals NHS Trust and the University of Nottingham; and a Wellcome Trust VIP Award to DPL. The views expressed are those of the authors and not necessarily those of the NHS, the NIHR or the Department of Health. Ethics approval Nottingham Research Ethics Committee 2 (08/H0408/195).